Image caption The man died on the Rossie Esate, near Inchture on Monday. 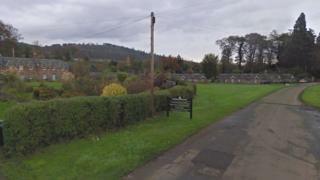 A man has died following a shooting in Perthshire, police have confirmed. Officers were called to the incident at about 11:30 on Monday, on the Rossie Estate near Inchture, Carse of Gowrie. It is thought that the man may have died as a result of an accident. A spokesman for Police Scotland added: "There was no threat to the public and the incident was contained to the immediate area. Inquiries are at an early stage and are continuing, and the man's next of kin have been informed."